The 2015 Malaysian Grand Prix could start earlier than originally scheduled because of Jules Bianchi's serious crash in Japan last year. Bianchi suffered a serious brain injury when he crashed under yellow flags in heavy rain and fading light in Japan last October - a race which had started under the safety car due to torrential weather. The FIA set up an accident panel in the wake of his crash which suggested a new four-hour rule, which would ensure a day race would not start within four hours of dusk or sunset. 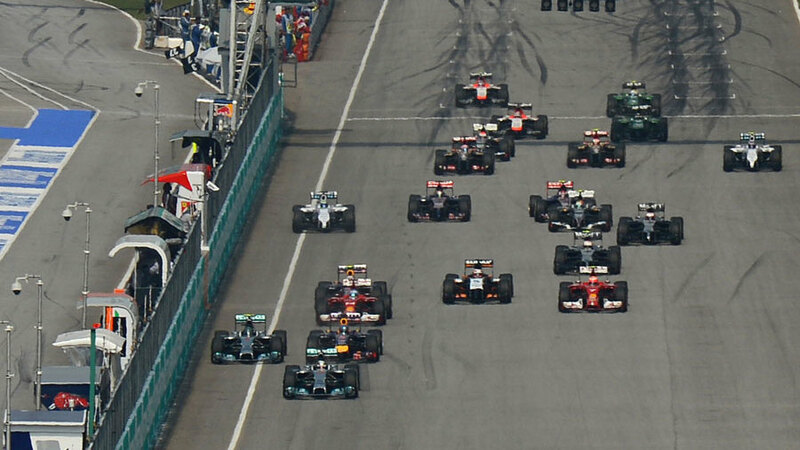 The late afternoon start has caused the Malaysia race to be hit with heavy downpours before, notably the 2009 race which had to be red flagged before 75% race distance, leading to half points being awarded. Malaysia is currently scheduled to start at 1600 local time this year but circuit boss Razlan Razali says Bernie Ecclestone is happy to make a change even though the four-hour recommendation is not written into the regulations. "Mr Ecclestone mentioned that because of the Suzuka incident the FIA has some time limit," Razali told Reuters. "So he is reviewing to move the start to the original time, maybe this year. For us it's good. It's a safer time bracket, so now people can come in for lunch, watch the race and about five o'clock they can go back. [Ecclestone] mentioned the possibility [of an earlier start]. We said if you want to go back to 1500, we fully support it." Ecclestone was keen for Malaysia to switch to a night race like neighbouring Singapore but Razlan says the F1 chief has backed down on that plan. "It's a danger to force us to do it. In the past [Ecclestone] was pushing but now I think it's the first time where he actually listened to us as a promoter what we want. At the moment [we don't want it]. Every circuit has its own identity; the danger is to copy someone else."